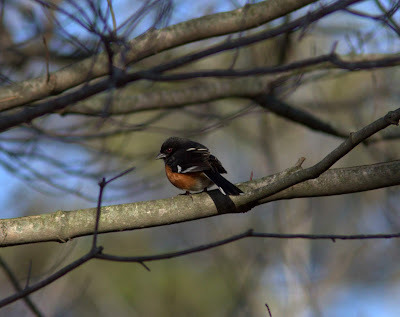 Since weather has been less than ideal lately, there has been little material for this blog. 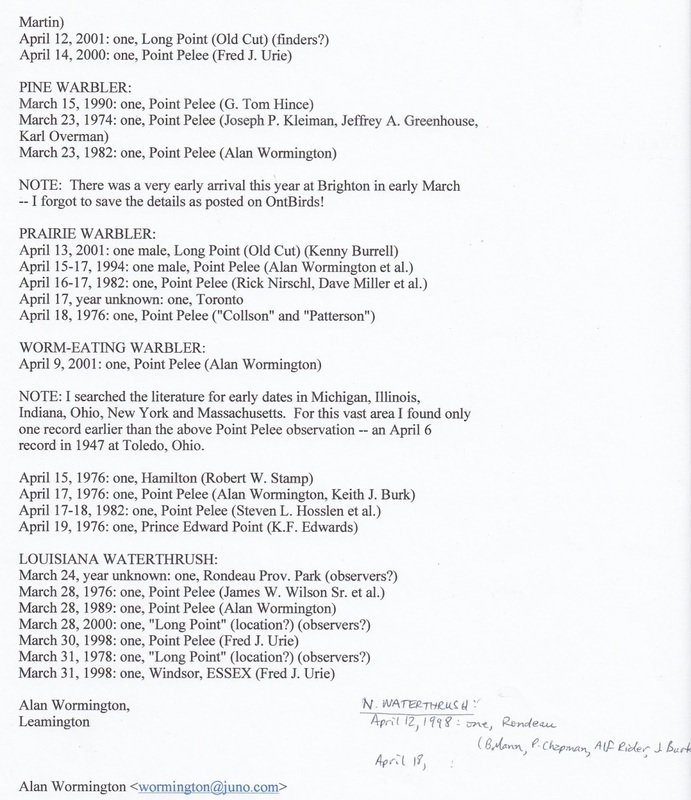 I recently looked at some early dates for birds, many of those provided by the late Alan Wormington. More on that a bit later. 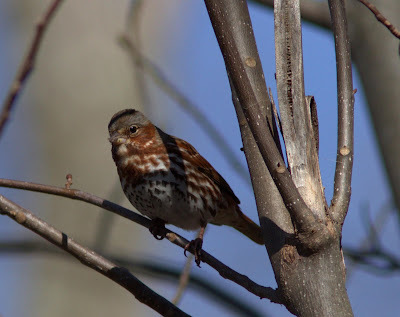 This past Saturday I went down to Rondeau Park. The weather was fairly nice, strange as it may seem. 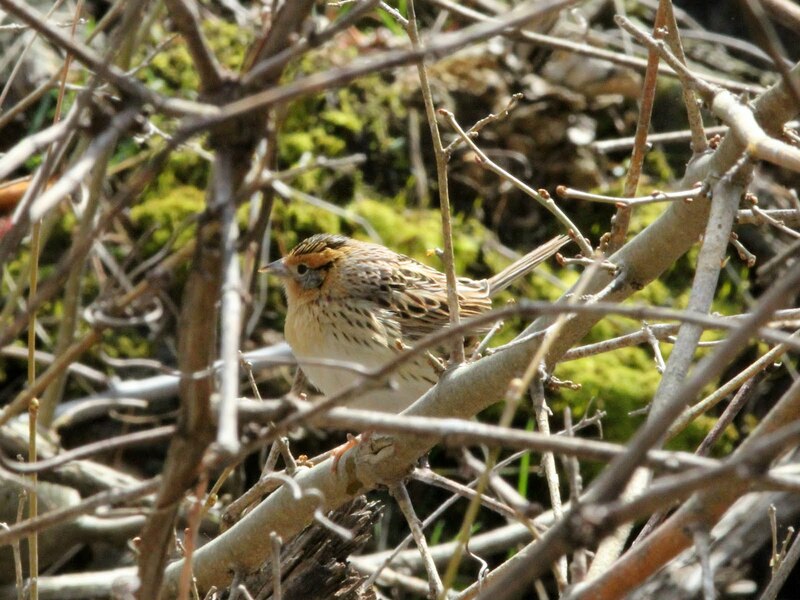 I walked around with Steve Charbonneau to look for early migrants. 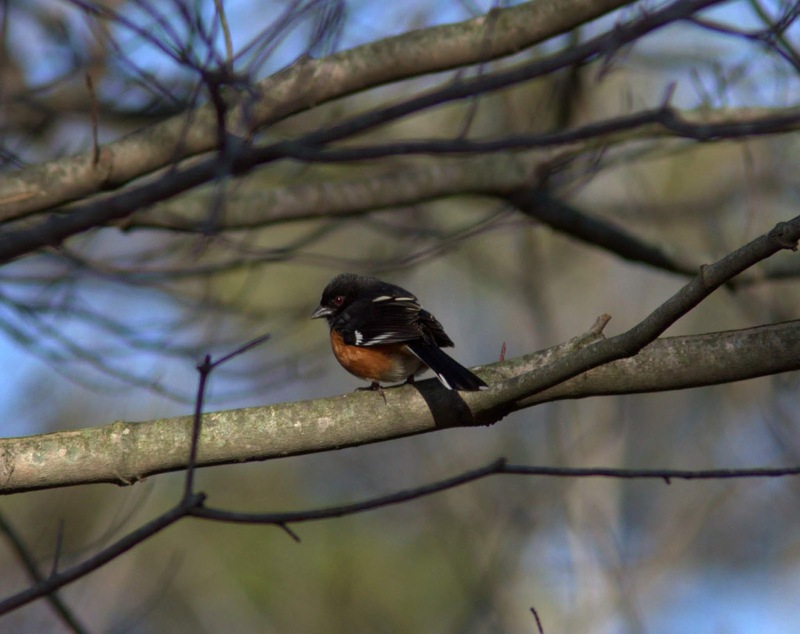 Lots of Eastern Towhees are around early this year. One along Lakeshore Road was singing a very odd song, which had us intrigued. Although we tried to make it into something else, it was just more-or-less a typical looking bird. 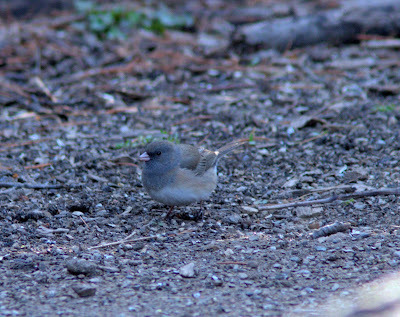 At the visitor centre feeders, some sort of intergrade junco was attending the scene. Many Fox Sparrows were in throughout the park. Along Harrison Trail, we found an early Blue-Gray Gnatcatcher which eluded the camera lens. The fields at Keith McLean CA are still quite wet and attracted a number of birds including some early shorebirds. Those were both Yellowlegs, some Pectoral Sandpipers and some Dunlin. No photos! We will need to check this place for Nelson's and LeConte's Sparrows this spring as I bet they stop there! A Le Conte's was already reported near Toronto today! Sunday dawned in the more typical weekend mode. It rained or drizzled all day, so I did mostly driving. (And of course I have to mention that the sun was out Monday!). I headed down to Wheatley Harbour first thing. Surprisingly not much was there. Mersea Road 21 fields was the place for action as there were thousands of gulls and ducks and some shorebirds. Viewing conditions were extremely difficult, so I have no idea what I may have missed! I did pick out at least three Glaucous Gulls, hundreds of Bonaparte's Gulls, and many of the the other common gulls. Shorebirds included a few Pectoral Sandpipers, Dunlin and Greater Yellowlegs. 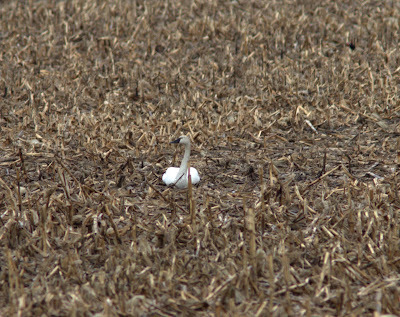 The onion fields saw little activity, but a single Tundra Swan seemed out of place. 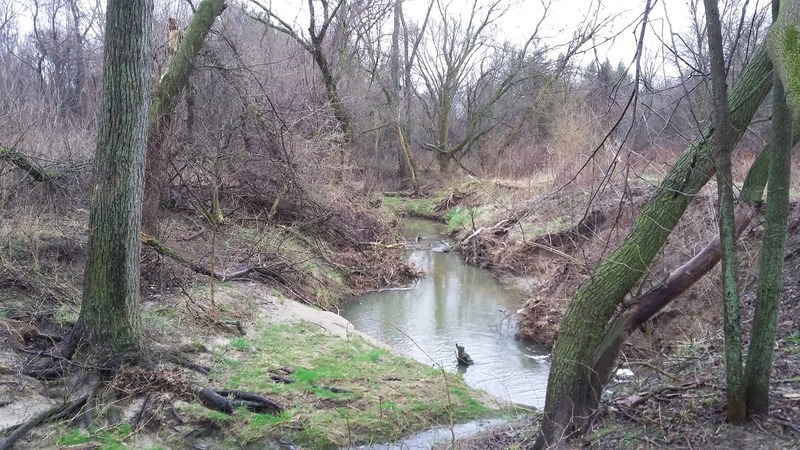 The rain almost stopped so I set out at Two Creeks CA at the north end of Wheatley. 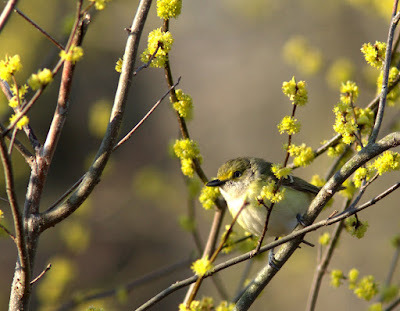 I did find at least three Yellow-rumped Warblers, but the highlight came in the form of a White-eyed Vireo. Photos were impossible in the conditions and rain began again during my walk. Regarding the vireo, it is not the earliest White-eyed I have seen. At Rondeau I have seen one 12 April 1998 and 13 April 2001. The former was record early at the time. I saved that informative note, as seen in the following images. 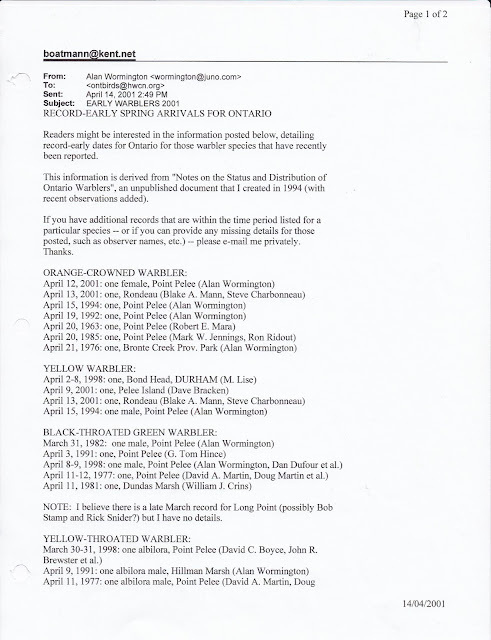 This past weekend the Ontario Bird Records Committee Annual Meeting (OBRC) was scheduled at the ROM on Sunday. I decided to head in an easterly direction on Saturday and check some areas around Long Point. I started along the lakeshore with a first stop at Port Stanley sewage lagoons. It was full of ducks with a good variety. It is often a good stop as you never know what shows up here. 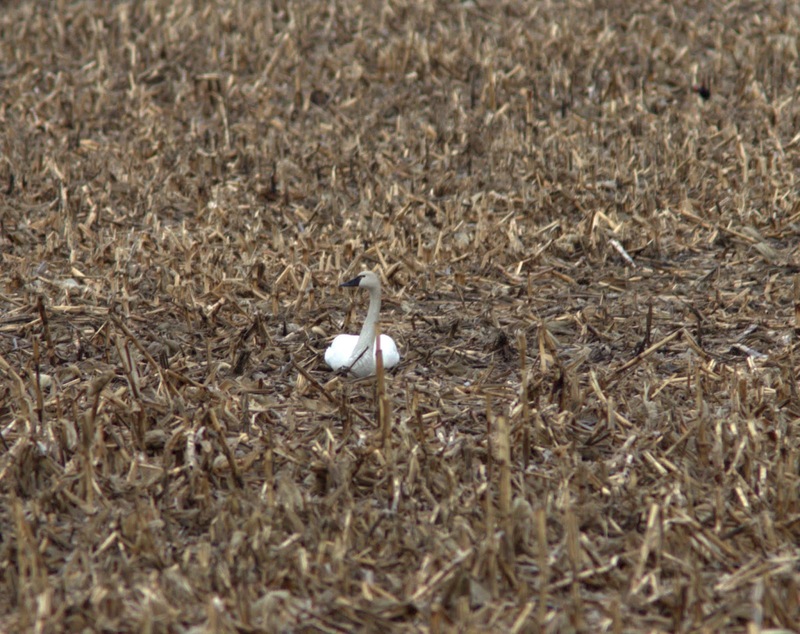 I recall seeing a pair of Whooper Swans once! Non-countable though. There was little to see at Port Stanley harbour, as well as Port Bruce, and Port Burwell. It was a very calm day with no wind and some fog on the lake. At least the sun was out--a novelty for a Saturday! 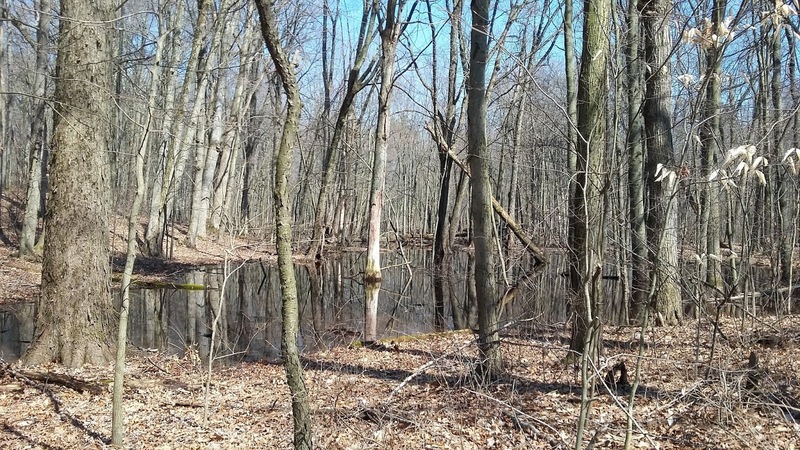 I continued on towards Long Point and first stopped at Lee Brown's pond. This is a good spot to see ducks. I recall in my early years of birding I saw my very first Eurasian Wigeon here. It seemed to be an annual event for a few years. 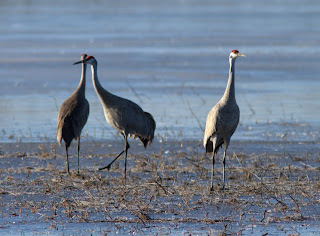 In the field to the north were several Sandhill Cranes and several gulls. I was pretty sure I saw a Little Gull, but it quickly disappeared behind some trees out of sight before I could make a conclusion. Next stop was a brief look at Big Creek Marsh wildlife area. 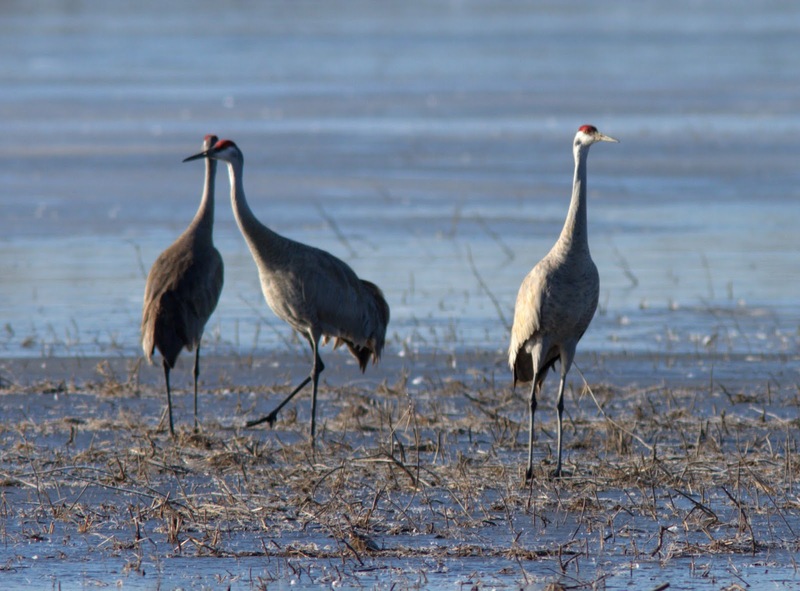 Several more Sandhill cranes were here. 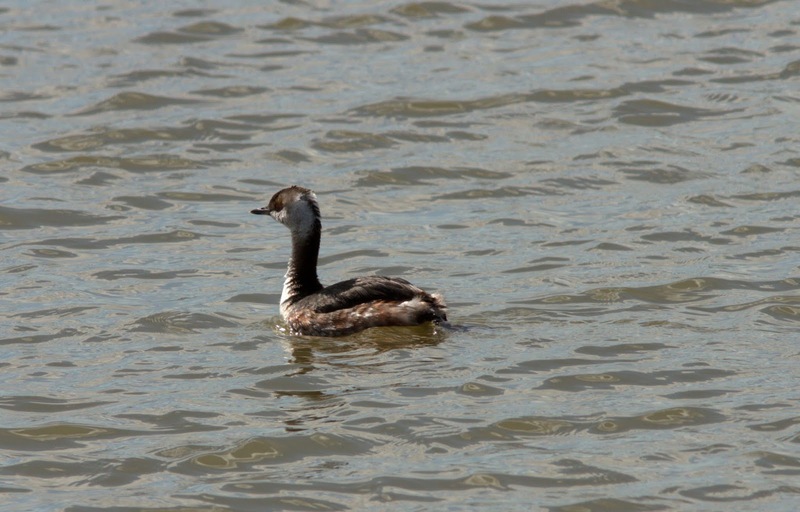 Out on the Bay were lots of ducks and many Horned Grebes. I continued on to Old Cut where banding was taking place. There is an excellent little gift shop there that is open occasionally where one can buy books and shirts. I did a quick walk through the "old" provincial park while in the area. 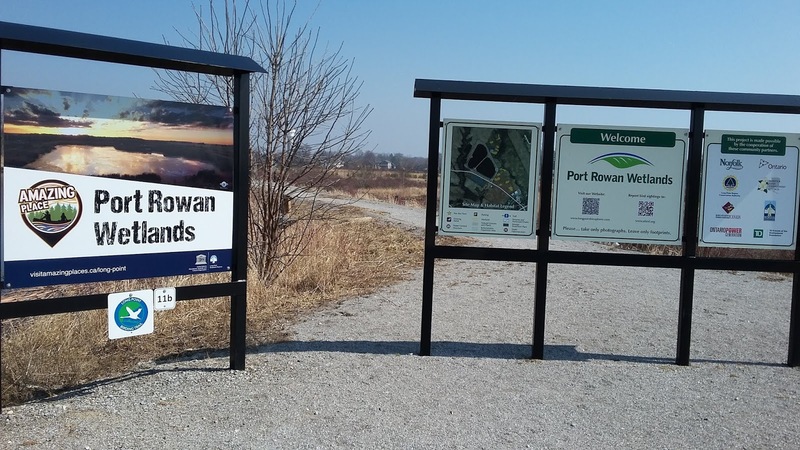 Next stop was Port Rowan Wetlands. (I did take a few photos with my phone on the trip!). This is the old sewage lagoon where things have been done right, creating a wonderful wetland. There was nothing of note, but soon there will be lots of Common Gallinules here. I recall going here when it was a lagoon 30 (really?) years ago. On this road is Ron Bankes Boats where I worked for a short period of time back then! 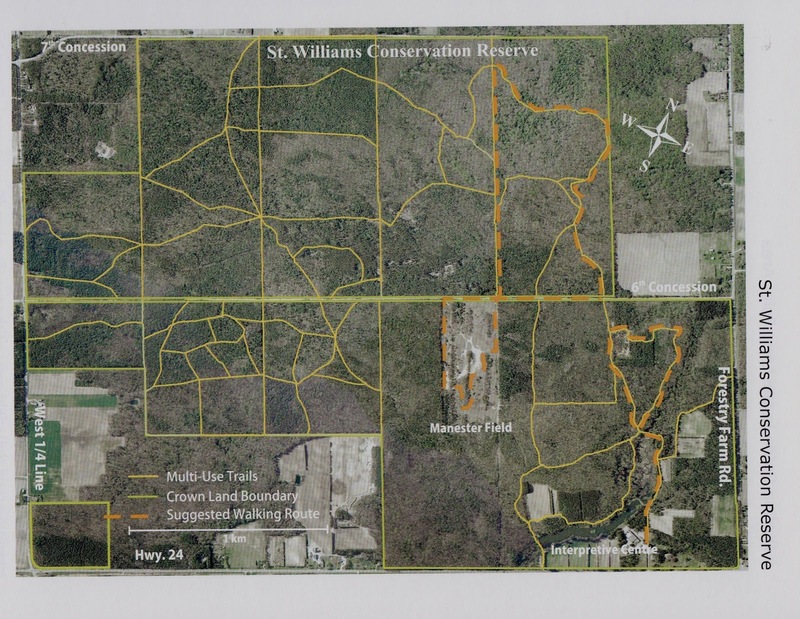 Next walk was the trail behind the LPBO headquarters. 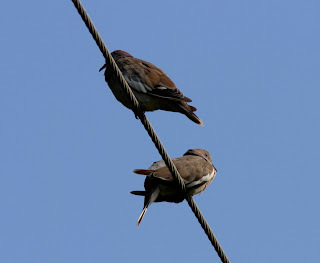 I saw a variety of birds here including the first Barn Swallow of the year. 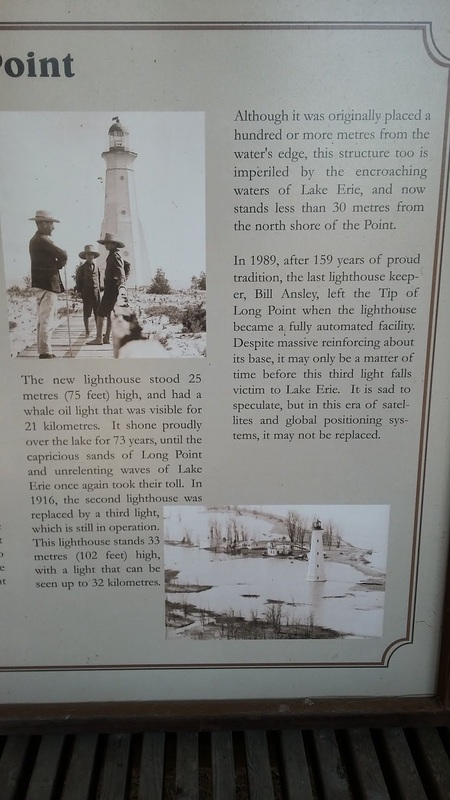 An interpretive sign talked about the Tip of Long Point where the scenery has change many time due to erosion, water levels and shifting sands. I had lunch at Lion's Park on the waterfront, then headed inland to St. William's Conservation Reserve. Much of this is the old forestry station. 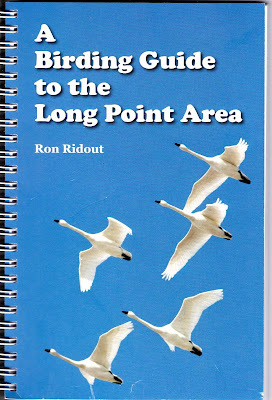 I had been here a couple of times in my early years of birding. It is an extensive block of land that is nice to walk through. Here I finally saw my first butterflies of the year. Just out of the car, I saw a Red Admiral ( have seen them in late March in the past though). Several Mourning Cloaks and Eastern Commas were seen along the way. The woods were very quiet for birds, but it was nice in the warm sunny weather. After this, I headed back to Backus Woods, and walked from highway 24 down to Concession 4 along a trail. Again the wood were quiet for birds, but I did add a Red-headed Woodpecker for the year list. 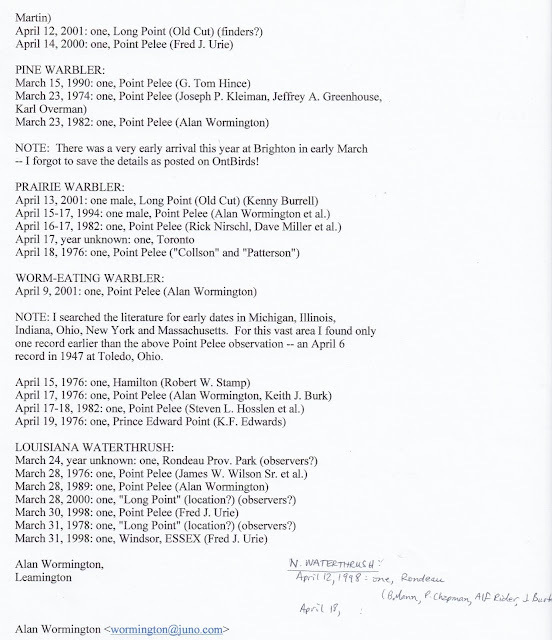 Normally, we might be seeing the first Louisiana Waterthrush by now. In the wet areas, Wood Frogs and Chorus Frogs were making noise as well as a Spring Peeper or two. There are some interpretive signs along the way. One spot identified an American Chestnut with its distinctive bark. 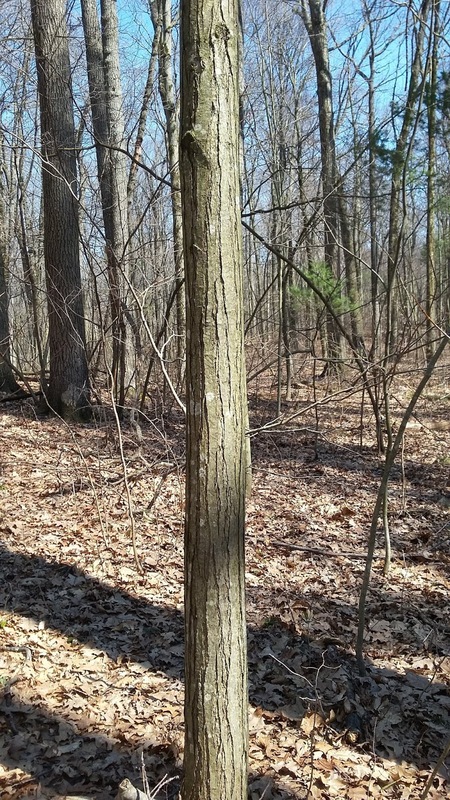 The American Chestnut was almost completely wiped out with the blight decades ago. These and many other birding places are all described in the excellent book by Ron Ridout. With all the walking it was getting late in the afternoon and headed up to Simcoe for the night. I got up early to head into Brantford to meet up with Bill Lamond for carpooling into Toronto. Unfortunately I did not get to bird the lakeshore near Toronto this year. 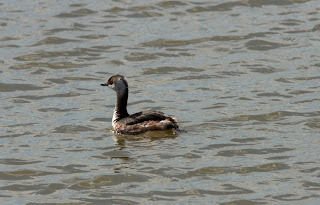 The Western Grebe had already been found a few days previous! (Last year I was the lucky one to find it at Port Credit). There was a whole mess of collared-doves last year and many White-winged Doves. They have indeed been increasing in Ontario. 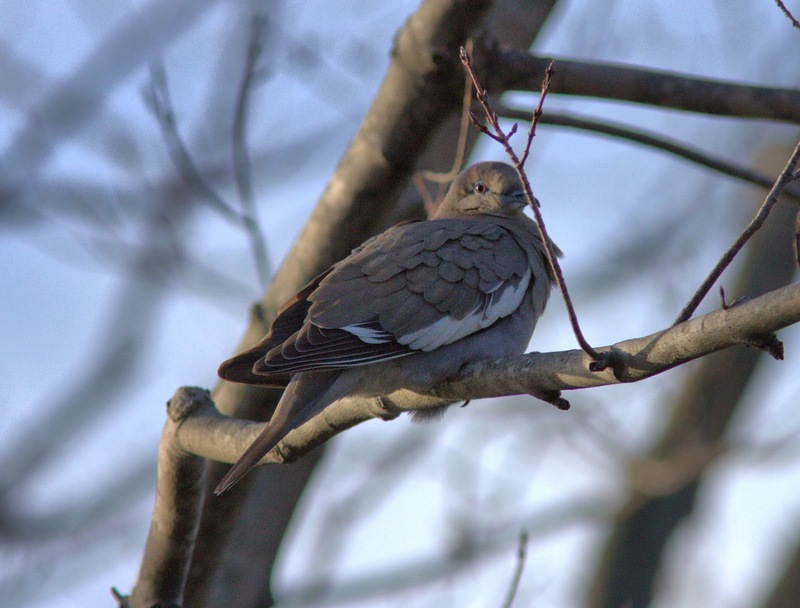 Speaking of White-winged Doves, the Rondeau bird returned from its winter vacation this morning! No surprise, but it was three days later than last year. Hopefully a female will arrive at some point and they can do things right this year! As a side note, the big project (47' Huckin's design) we did at work last year was launched last week to soak up. Today it was holding its own! Early April is heating up!